On Saturday night, Feb 26th come out and enjoy Greene County’s own Rob Heiliger with his Americana/Rockabilly flavor. Rob’s original lyrics and music have been influenced by Merle Haggard, Johnny Cash, Hank Williams, Lefty Frizzell, George Jones, Howlin' Wolf, Don Rich, Roger Miller, Vern Gosdin, John Prine, Jimmy Martin, and Carter Stanley. You will be entertained! His original "Walking' to Clifton" is always a treat. Rob is well known for his local performances as lead singer in the Ohio Corndaddy’s and as rhythm guitar and vocals with Crazy Joe and the Mad River Outlaws. 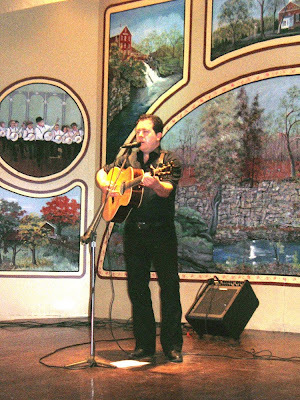 Rob has longtime hosted the Open Mic Series at Peach’s Grill in Yellow Springs. Check out Rob on Face book, MySpace and his own website www.robheiliger.com. The show starts at 7:30pm, box office opens at 6:30pm. The Clifton Opera House is located at 5 So Clay Street, Clifton, 45316. Call for information 937.767.2343 or visit our website www.villageofclifton.com.